This is my new cover spread. Can you picture yourself revealing yours soon? 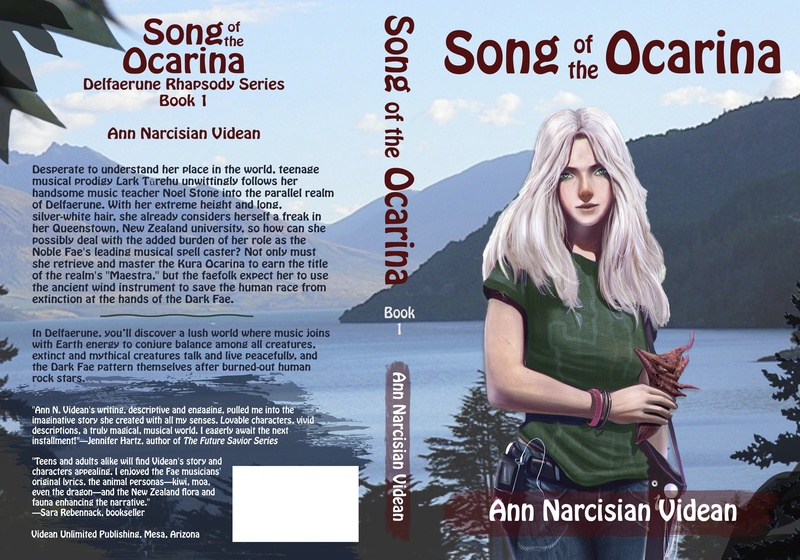 At this moment, I am forty pages from finishing the final edit of my second novel, Song of the Ocarina: the first book in a new-adult fantasy adventure series. Once I format it and upload it to Amazon’s CreateSpace I will have a self-published print-on-demand book. Woo hoo! Would you like to know how to get to this point with your book? My first foray into self-publishing happened in in 2011 with the self-publishing of my first women’s fiction novel Rhythms & Muse. Since then, I’ve helped dozens of other authors write, edit, self-publish and market their books. During all the years in this work, I’ve interviewed and worked with a wide array of literary experts who shared their secrets when it comes to book creation. Now, I’m sharing all those secrets with you in a series of three workshops at the Tempe Public Library. The topics we’ll cover include: book creation steps, editing, and marketing. People new to the idea of writing a book, or who aren’t sure how to get a written book published will learn how to navigate the process. Learn the key editing techniques to polish your book to impress publishers. Have you already written your book? I will share unique book marketing ideas to spark buzz by leveraging your book’s compelling content. Each Saturday workshop runs from 11 a.m. to 12:30 p.m. I hope to see you there! Learn more at the Tempe Public Library site.